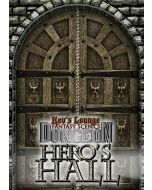 Any well-developed fantasy world is bound to be packed with hundreds of religious orders and cults. 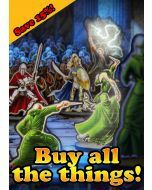 This set of 6 customisable high-quality paper miniatures is designed to allow you to easily create the devoted followers of virtually any cult or holy order you can imagine! 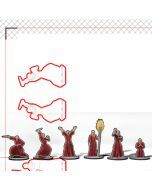 This set of paper miniatures includes 6 cultists/monks in a variety of poses. A tiny glimpse at the almost endless possible variation this set allows for! 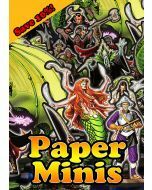 The paper minis are scaled to 28mm, and will look good alongside most popular brands of miniatures and all manner of 28mm scaled scenery. Each mini has a distinctive front and back, and both sides feature rich and gorgeous detail. The detail is boosted by the high resolution of the PDF, and the colours have good contrast to make them pop at a distance! 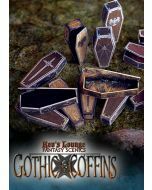 The minis are designed with removable bases. What's the difference between the Brothers of the Fire and the Brotherhood? 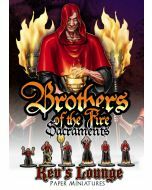 The Brothers of the Fire set includes just a single version of each paper mini, giving you 6 unique designs for a nice low price, with a unique fire theme on their habits. 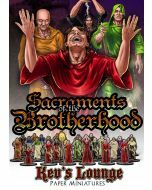 The Brotherhood set has a massive variety of colour options and extra details like hoods and sigils with hundreds of thousands of unique combinations, thus allowing you to create the members of virtually any cult you can imagine. If I have one, is it worth getting the other? If you have the Brothers of the Fire set and want more, it's definitely worth getting the Brotherhood set too. 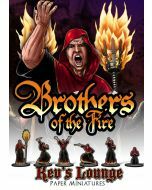 The minis in the Brothers of the Fire set have been specially created with a unique deco and cannot be recreated with the Brotherhood set, so if you have both sets, neither is a waste.